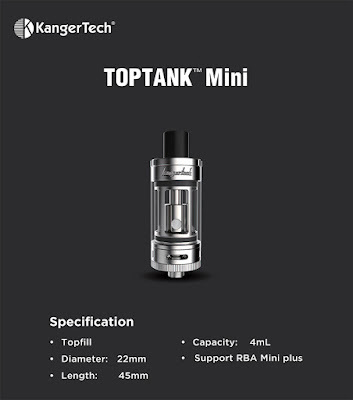 Kanger Toptank Mini is a upgraded version, on basis of the popular Subtank Mini. It's equipped with a top-fill option for easy e-liquid refilling. The Toptank Mini supports the new SSOCC atomizer heads which creates more airflow, vapor and flavor. Allowing for the DIY fun, the Kanger Mini RBA Plus Deck is included and prepared for advanced users who like to build their own coils. The design of 510 drip tip allows you to replace with any 510 threaded type.